Invitation design ~ just recieved this invite from our friends at Radar of Tiny Pictures, and they never cease with the tiny jokes… this one really made me feel like an old lady. That is some of the smallest type ever! Adorable that it came with a magnifying glass perfectly aligned on the card. 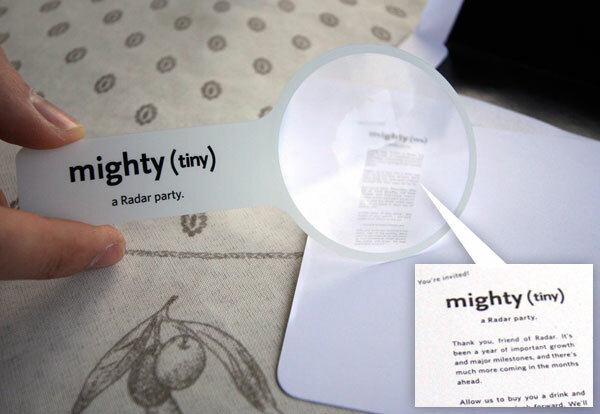 The private (with public sharing allowed) mobile photo site sent this invite for their Might (Tiny) Radar Party! Which will be taking place at the end of the month… so keep an eye out for more info on the public party in SF if you’re an avid Radar user. 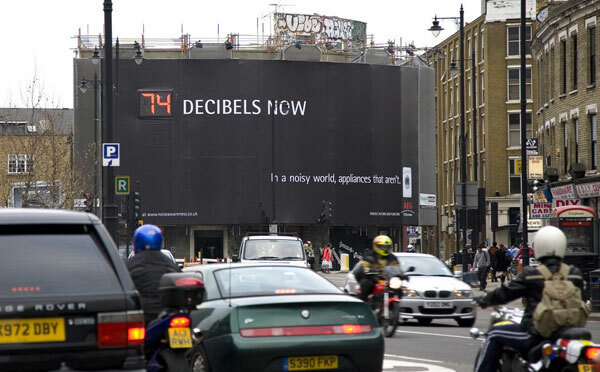 If you’re not, well maybe you should be. It’s a nice anti-facebook solution for all those pictures you don’t want EVERYONE to see, but just a few super special friends. See more pics on the next page!!! Mother’s Day Reminder ~ Since i just remembered, wanted to remind you too - Mother’s Day is Sunday. And you’re running out of mail order time. Tracey at Delight just saved me from my minor Mother’s Day panic, and she gave me a coupon code and some shipping deadlines for you as well. 15% off the purchase of $25.00 or more - code: NOTCOTLove (case sensitive) good through May 31st. Cut off for ground shipping to make it for Mother’s Day is tomorrow (6th), Priority Flat Rate is Weds (7th), and Overnight is Thurs (8th). Why Delight? Well i’m openly vouching for them because you cant afford to have something go wrong when shipping to your MOM ~ the gift wrap is gorgeous (no chance of gaudiness here) ~ and the selection of products is perfectly fun and gifty, while still useful and gorgeous for any situation. 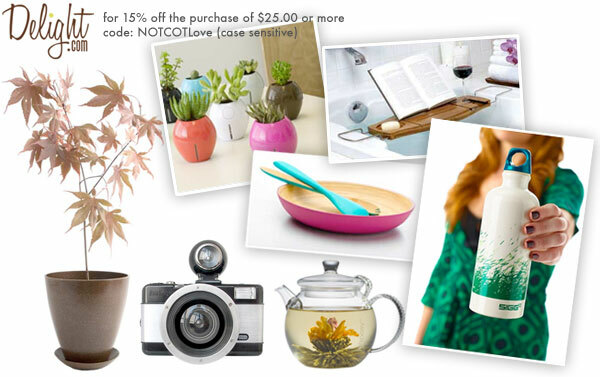 Some of my picks above are the: Grassy SIGG Bottle, Bio-Degradable Indoor Japanese Maple, Bambu Serving Set, Lomo Fisheye Camera, Bamboo Bath Caddy with Wine Glass Holder (i so want this! 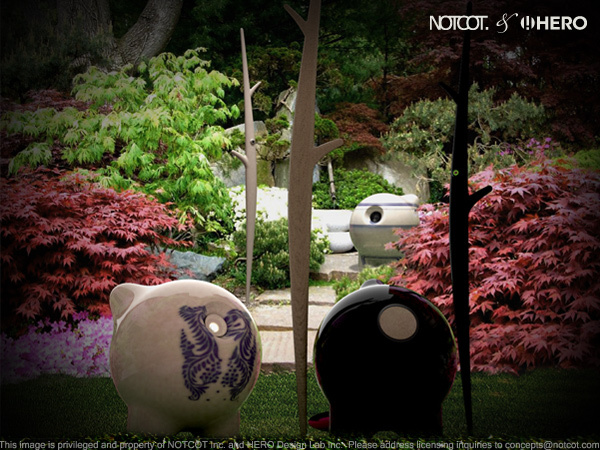 ), Grobal Self Watering Pots, and Blooming Tea Sets. Hey mom, you so never saw this post. Blinged out faux-designer weaponry were all the rage at Gallery 1988’s latest show in LA that opened this weekend - Peter Gronquist’s “The Revolution Will Be Fabulous: A Weapons of Mass Designer Show” - and i must admit i was pretty disappointed. The biggest problem for me, was that in knocking off luxury brands, the key thing is to keep that luxury designer quality feel to it! 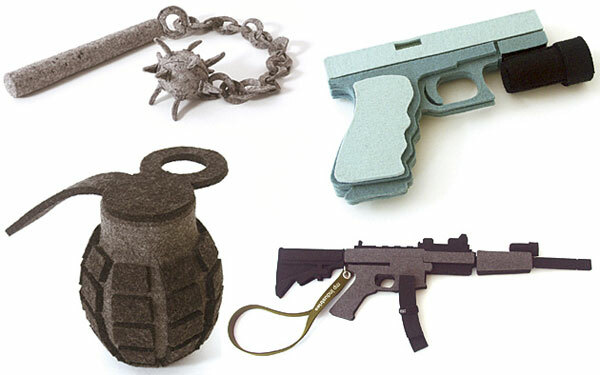 And up close with these weapons i just wan’t feeling that. 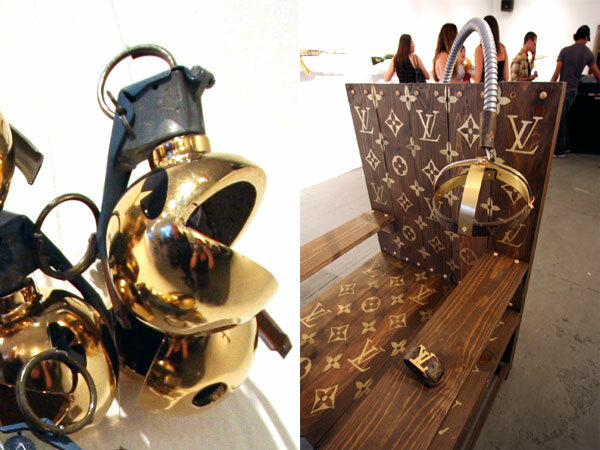 Highlights were definitely the Louis Vuitton Electric Chair in the center of the gallery and the Pacman Grenades! Over a dozen more pictures on the next page to give you a feel for what the scene was like, and a few close ups as well. I came across Wing-Ip Ngan’s Etsy store a while back and fell in love with his prints - so colorful and whimsical…They remind me a bit of the nonsensical phrases on notebooks and cards that I used to come across during my childhood in Thailand - lighthearted and a little bit random. Wing-Ip uses a Gocco primarily to print and I have to give props to his Gocco skills - all of his prints are made of multiple screens and colors (registration is no easy feat, people, at least not with our little B6 machine). 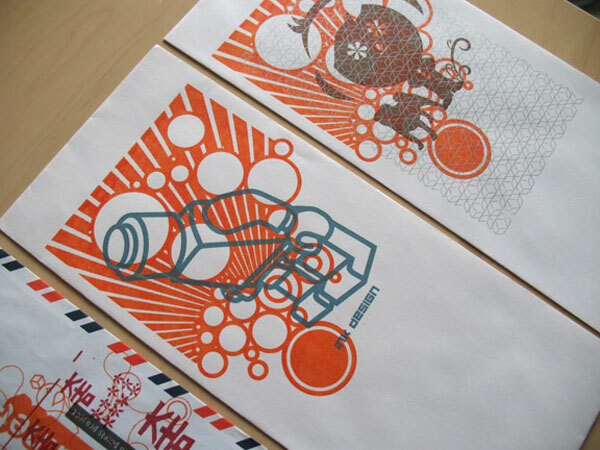 More of Wing-Ip’s prints can be found in his Etsy store. For some of his graphic design work, check out Ink Design. On interesting PR emails i received today, this one was pretty funny… i have no idea whether this was a contrived spot, it does seem plausible it could have been an accident, but none the less it has that Blair Witch/Cloverfield panicked “attack of the crabs!” feeling to it… and it’s a fun friday video (embedded on the next page for your viewing pleasure! )… So what do you think? And does it work? 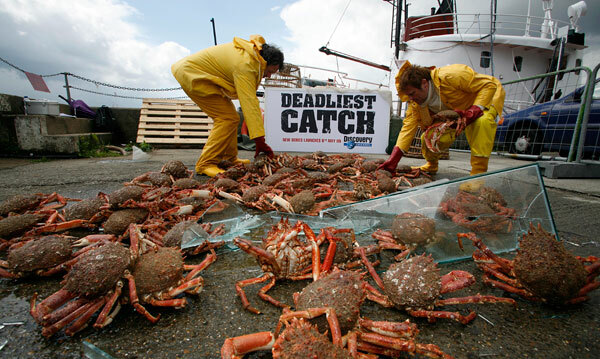 Behind the scenes footage of Discovery Channel shows are definitely fascinating… this one of the Crab accident is from the Discovery Channel show, Deadliest Catch. … I have yet to brew my first sorapot of tea - more to come on that later… But for now - check out the freshly launched official Sorapot site! 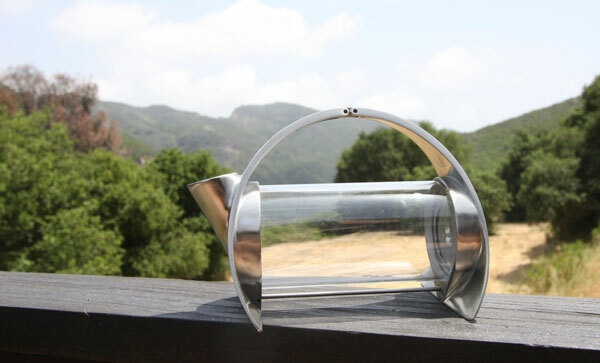 On the next page see the unboxing of it out in Topanga Canyon… a few sneaks peeks for you of the factory in the making… and a refresher diagram of the making of the Sorapot and how this is a testament to the power of design blogs to help small designers get out there! 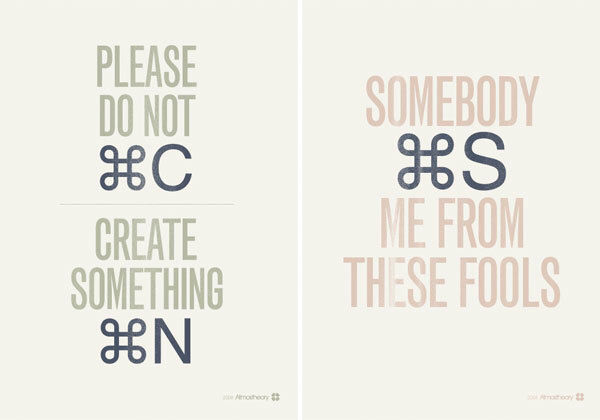 I giggled when i first saw these “Command” posters on Swiss Miss… and then as i read them all a bit more, i couldn’t help but think it would be awesome to have Somebody Save Me From These Fools above my seat in a conference room… as well as the Please Do Not Copy, Create Something New! Ahhhh, they are all so relevant for our day to day work. Also check out the Close Your Eyes and Open Your Mind on the next page. You can order the three set from My Little Underground for $12. 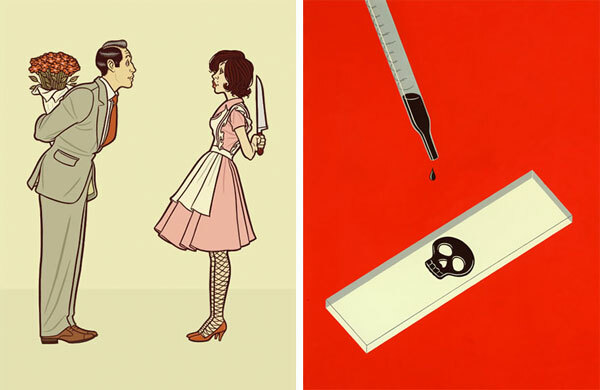 I’ve been meaning to post about the incredible work of Nick Dewar all week, these images have been hanging out on my desktop waiting… Above are my two favorites, not that i’m on a death theme or anything, but they were just so beautifully dark! Who is he? “Born in Scotland, grew up in a small fishing town on the East Coast and attended Art School in Glasgow, lived in Prague, London, New York and on a sheep farm in Cumbria. After living in New York for nearly ten years I have recently moved to Southern California. I no longer have to bathe in my kitchen.” Additionally unless you’ve been hiding under a rock, you’ve probably seen his work in a slew of top magazines, newspapers, book covers, corporate work and more… and it’s easy to see why. He’s incredibly talented and makes you laugh while taking on less than happy subjects. And besides his brilliant portfolio online… i love that he has a “But How?” section of his site, answering Q&As for artists and illustrators, showing off some of the behind the scenes sketches, and more! 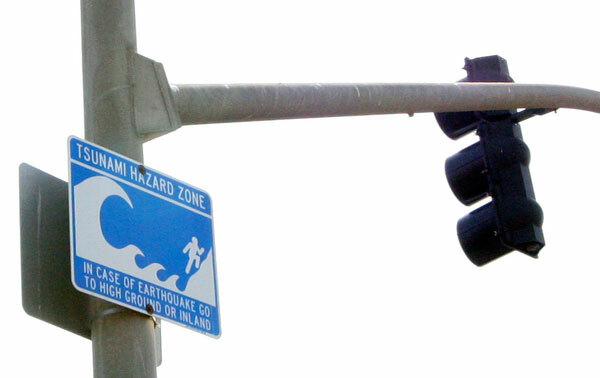 Tsunami Hazard Sign - While at the beach running around in Swims, at a crosswalk we noticed this new Tsunami Hazard Zone Sign - and i must admit the graphic design was quite inspiringly adorable. Nothing like instilling fear in the community through simply vector imagery of a man running for his life up a steep cliff from a massive wave and three mini ones chasing him. Great graphic, had to share it… more closeups on the next page. NOTCOT Note: Here’s another treat from Anna of Sub-Studio! Swissmiss turned me on to Delaney Jane Larson, who creates gorgeous illustrations under the pseudonym of Plane Jane. I very much like how she has usurped the iconography of traditional playing card designs to create her own cast of characters. The subject of her work is very much the stuff of dreams - little monsters, the wool of shorn sheep creating clouds, pimped out Kings and Queens. Her color palette is kept fairly limited in order to “counterbalance the situational idiosyncrasies” of her illustrations. Her strongest work is in the illustrations and paintings themselves, although she has translated some of the illustrations into t-shirts, cards, ceramics, and tote bags, available here. See more of her great illustrations after the jump! 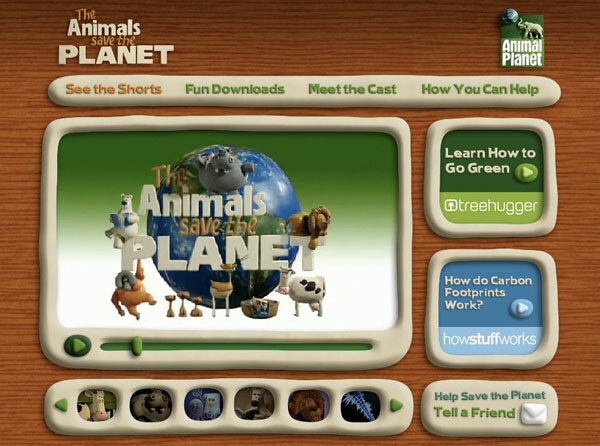 Warning, i have this tendency to do late night visual research binges - (binge and post?) 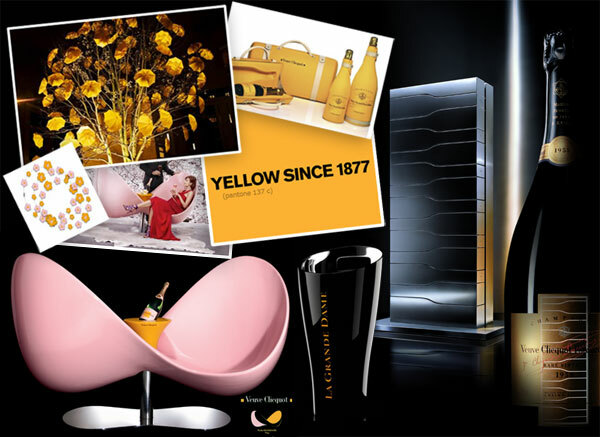 - which result in rather large collaged image files - and tonight between the bottle of Veuve Clicquot and the press release i’ve been anxiously sitting on until i can share it with you without breaking embargo - i really couldn’t help myself and dug up any and all crazy Veuve Clicquot inspired designs on the net. And really i’ve been truly fascinated by the really cool designs that have been popping up lately… the Karim Rashid Loveseat grabbed me in NY at ICFF last year (it’s SO fun to sit in!) and then the Porsche Design Vertical Limit fridge at the Toronto IDS this year… and i just wanted to see what else there was… So see below for more of that signature Pantone 137c.